Characterized by steep sloped sides, the A frame home came to be in the mid 1930's when Austrian, Rudolph Schindler designed one for his vacation abode in California. From the 1950's-1970's, this type of home became quite popular and referred to as the 'do it yourself dream-come-true home for the middle class.' The A frame soon popped us as hot dog stands, liquor stores and churches around the country before the fad faded away. But I love the ones that still stand...or were made anew. The advantage to the A Frame is snow and debris moves off the roof easily, offering low maintenance. Plus, the striking design is an immediate eye pleaser and conversation space. Yet because of the shape, it offers much less storage. What a wonderful idea to build bookshelves into your A frame. 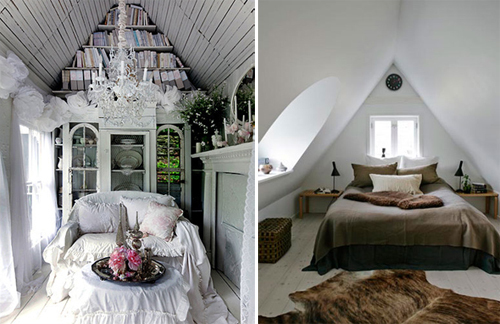 There seems to be an inherent coziness to an A frame room, doesn't there? I think lots of blankets, pillows and texture work beautifully here. These next two rooms don't have the steep angles of the A Frame but still take advantage of that wonderful angled roofline. I love the exposed beams as it adds such depth and character to the rooms. I think the fun part would be deciding which light fixture to hang from the middle. This chandelier is quite charming and rustic above, fitting the tone of the space. 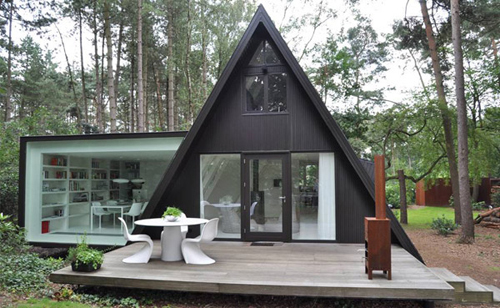 This stunning modern version is the Allandale House. 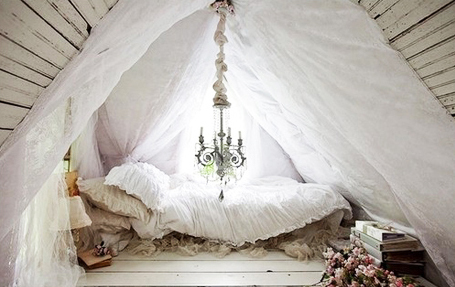 Ah, coziness and prettiness. Wouldn't this be delightful?